Most of us are familiar with guavas. Guava is known as ‘Pera’ in Konkanni and Portuguese, ‘Peru’ in Marathi and ‘Amrud’ in Hindi. Guava trees grow easily and anyone who has enough space for a kitchen garden will definitely have a guava tree. You can get abundant fruit if cultivated in fertile soil. They are of interest to home growers and are mainly cultivated in tropical and subtropical countries. Guavas have great nutritional value. They are rich in Vitamin C and dietary fibre. They are extensively used in culinary preparations or can be eaten in its natural form. You can have jam, marmalade, jelly, juice and prepare tarts, pies, etc. I think, Guava is most popular and relished as good old Guava Cheese! 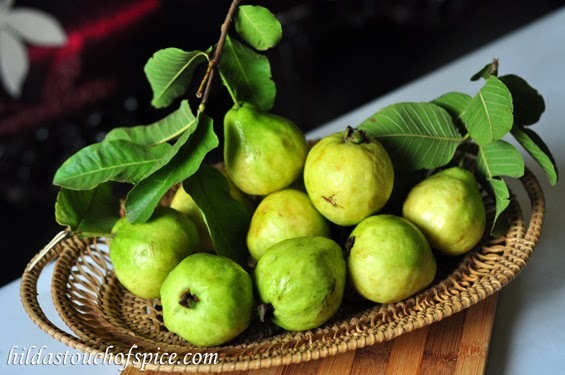 Guavas are high in pectin which is essential in canning and preservation. It is the pectin in ripe guavas which helps the cooked fruit to set into jam, jelly and cheese. Guava cheese has the firmness of regular cheese and when cut resembles a wedge or slice of cheese hence the name Guava Cheese. I have fond memories of Guavas and Guava Cheese and I’m sure many of you may share the similar sentiment. We had quite a few guava trees in my maternal home which bore red guavas. Do you remember when you enjoyed sweet guavas sliced with chilli powder and salt outside the school and college? In Dehu Road where I spent four years of my early years of marriage; we had guava orchards nearby and they were sold cheap. I was fortunate and privileged to get an opportunity to use sweet ripe guavas to make several goodies. In my hometown and ancestral home – Goa, we had guava trees which were so short and easy to climb. I would love to climb the tree and relish sweet red guavas. Above all, I distinctly remember the guava cheese prepared in the traditional way. 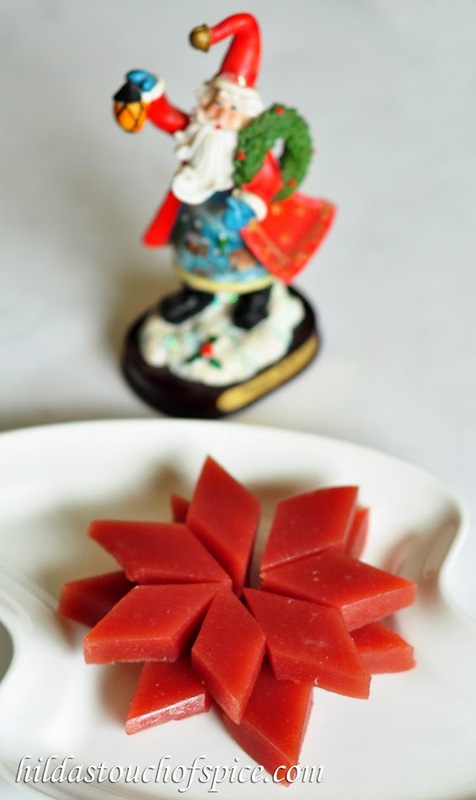 Today’s recipe is the most loved Perad or Guava Cheese which is a Christmas special. It is very delicious but quite a painstaking task. But we all know that all good things do not come easy! You have to be vigilant and use the right tools to get the best cheese which is addictive. You cannot eat just a piece or two and be satisfied. When you start the process of making this superb cheese, your home will be filled with the sweet, heady aroma of guavas. My recipe will give you delectably soft guava cheese which will just melt in your mouth. Of course, you need to select good quality, ripe and sweet guavas. The quality of the fruit determines the end product. If you use red guavas, then you will not need to use any food coloring. If you prefer the natural yellow color of guavas then go ahead and retain it. 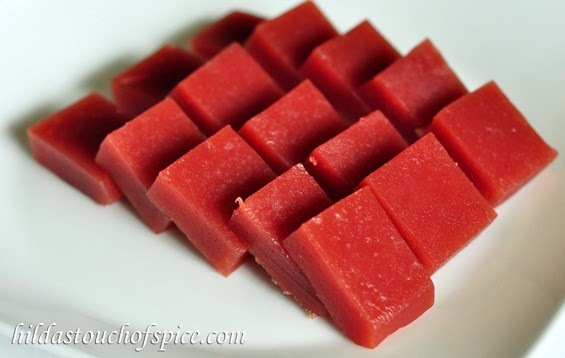 I like a little color in my Guava Cheese so I use it very sparingly. Wash the guavas; lightly slice off or core the tops. Place the guavas in the pressure cooker body with enough water to cover the guavas. Pressure cook for 2-3 whistles or until soft. Let the cooker cool down. Transfer the softened guavas with a slotted spoon in a bowl and let them cool down till they are comfortable to the touch. Try and peel off the skin as much as possible. Halve all the guavas and scoop out the seeds. Place the seeds in another bowl. Use a metal sieve to extract pulp from the seeds. Chop the guavas and place in the mixer/grinder along with the pulp extracted from the seeds. Grind to a fine and smooth paste. Strain through a metal sieve again. Transfer the pulp in a wide and thick bottomed dekchi/handi/pot/ non-stick pot or in the pressure cooker body. (I used the pressure cooker body). The cooker handle helps to grip firmly and comfortably while stirring. Add the sugar and a pinch of salt. Cook on medium heat. Keep stirring continuously while on heat. To stir, use a wooden spoon with a long handle if possible. At first, it is easy to stir as the sugar will melt and there will be a lot of moisture/liquid in the mixture. Conserve your energy to stir vigorously…later! As the mixture starts thickening; Beware! There will be a lot of bubbling and spluttering. That is why it is necessary to use a spoon with a long handle and preferably a wooden one so that the handle will not get hot and you will feel comfortable while stirring. Stir the pulp mixture continuously when the mixture is thickening. Be alert or there is a tendency for the mixture to burn and stick to the bottom. Keep stirring vigorously. Gradually, the mixture will be bubbling and then as it thickens it will start leaving the sides of the pan and you will be able to see the bottom of the pan while stirring. It is time to add and mix in the butter. 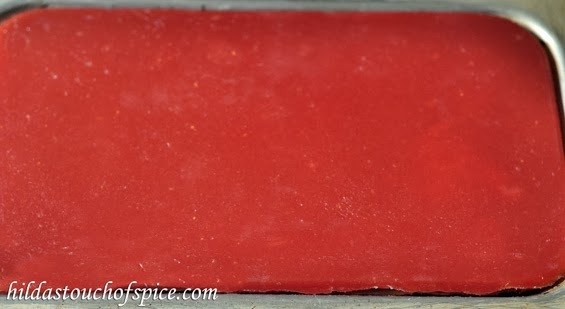 Add a few drops of red color to tint the mixture. Stir to combine well. The mixture will start looking a little glossy. To test if done, put a little mixture in a small bowl/sauce of water. If it forms a soft ball without disintegrating in the water then it is time to pour it out. Pour the mixture in a well greased deep tray. It should be a thick layer about 1 cm. thickness. Level the mixture immediately. Allow the guava cheese to set and cool thoroughly. It may take a couple of hours if the weather is cool and dry. I usually make my guava cheese in the night and so it cools and sets overnight. Turn out the guava cheese on a cutting board or on your clean kitchen counter. The guava cheese will come out with ease. Cut into desired shapes and sizes. Makes about 1 ½ kg. Hi thank you for the yummy recipe. please let me know how long can the guava cheese remain out or can we make now and use for Christmas storing in the Fridge.